Hello, Welcome to Abruzzo Embassy! Massimo Criscio has always loved entertaining guests and sharing his passion for good food and wine with friends and family. So, in 2004, while working for a big company in corporate America, he decided to leave behind a successful career path and head back home along the shores of the Adriatic Sea to see if he could turn that passion into a new career. In 2006, he launched PALAZZO TOUR D’EAU (a restaurant/hotel) and ABRUZZO CIBUS (a cooking school). Now, he makes new friends from all over the world by sharing his own Italian lifestyle. This is nothing like most Italian commercial tours that tend to be overly structured, crowded and often focus on typical tourist destinations. Instead, Massimo has created a warm, welcoming, family atmosphere where guests can have an authentic Italian experience. 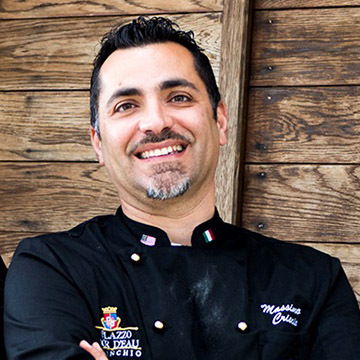 Combing all of his corporate America learnings, paired with his personal passion for hospitality, Massimo was able to create a travel and culinary experience like no other. And, because Massimo owns every aspect of the entire experience – from the palace to the chefs to the transportation – he and his dedicated staff treat guests like they are family. Palazzo Tour D’eau is a unique destination and not the traditional restaurant/hotel kitchen found throughout Italy. The old wine cellar was transformed into an exclusive kitchen for their cooking classes. Guests can just feel the Italian history of the space as they learn how to make pasta, pizza and Italian staples. The Abruzzo experience is ideal for guests who want good food, great wine and pleasant company. The palace has just 13 rooms, so guests enjoy an intimate experience in a beautiful setting atop a hill with a breathtaking view of the region. Often one group will take over the entire Palazzo Tour d’Eau and if not, you make lifelong friends with your companions. The experience includes cooking classes, local touring, time for relaxing and exploring and of course eating and drinking just like the Italians. Guests will learn how to cook special Italian recipes that are delicious but also meant to easily be made and shown off to friends and family back home. After 11 years, Massimo and his team have become the leading culinary travel destination in Abruzzo with some of the highest guest satisfaction ratings in Italy – just check out Tripadvisor.com to see just how much guests love Abruzzo, Massimo and the crew. It is no surprise that their motto is: When extraordinary isn’t quite enough! Abruzzo Embassy is a worldwide provider of professional genealogy research services in Italy. Want to be updated with our latest news and offers? Join our newsletter! 2017 © Abruzzo Embassy. All rights reserved.